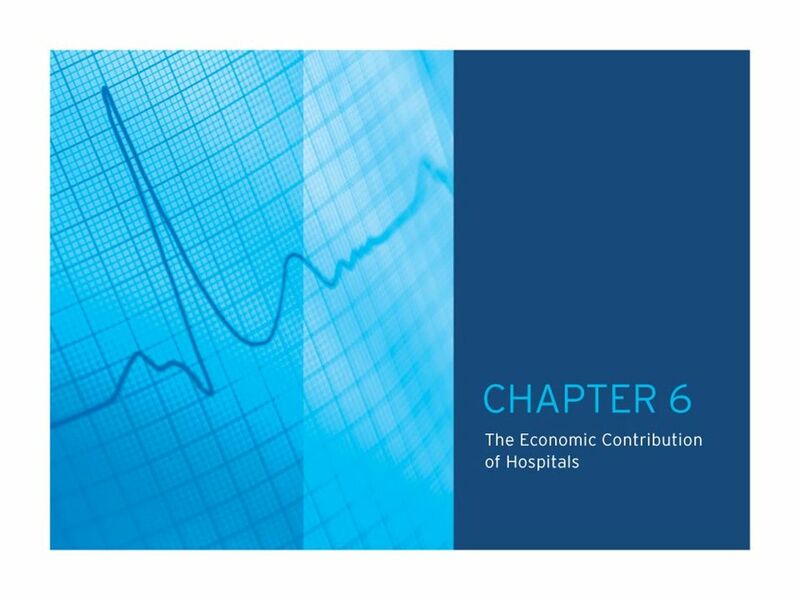 TABLE OF CONTENTS CHAPTER 6.0: The Economic Contribution of Hospitals Chart 6.1: National Health Expenditures as a Percentage of Gross Domestic Product. 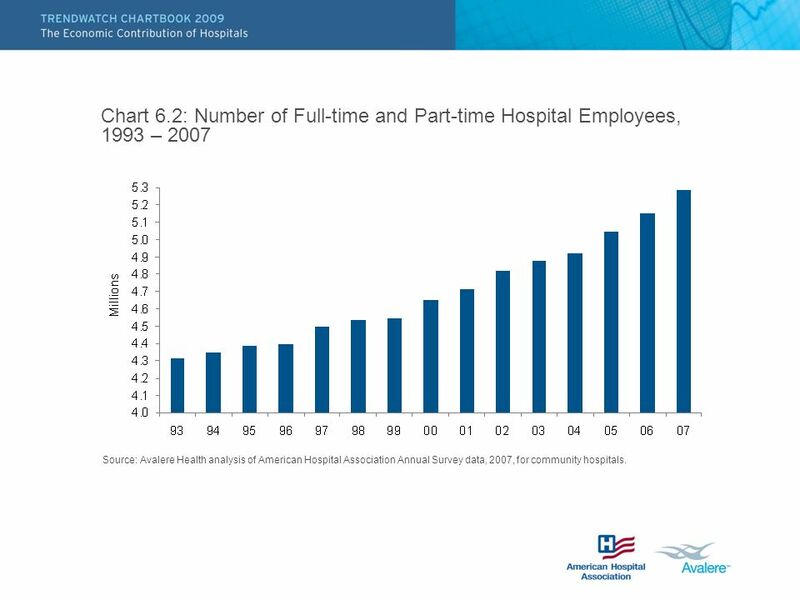 4 Chart 6.2: Number of Full-time and Part-time Hospital Employees, 1993 – 2007 Source: Avalere Health analysis of American Hospital Association Annual Survey data, 2007, for community hospitals. 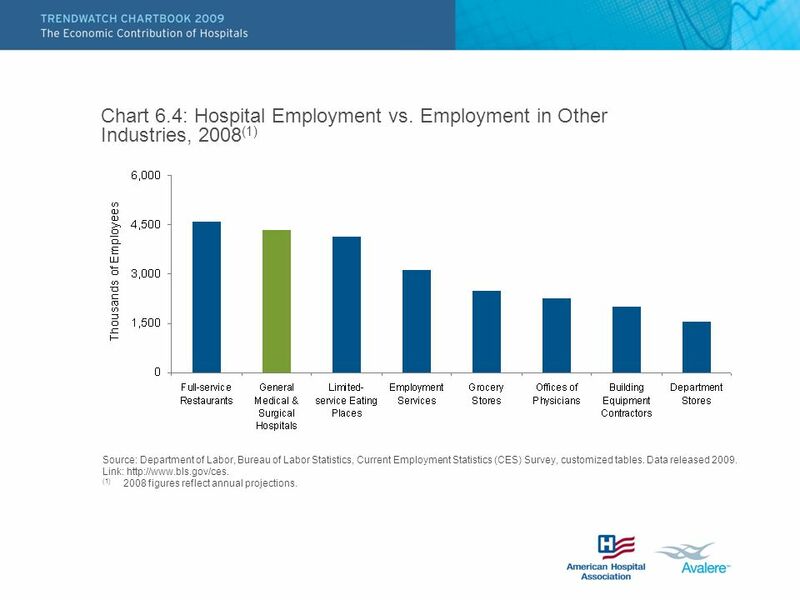 6 Chart 6.4: Hospital Employment vs. Employment in Other Industries, 2008 (1) Source: Department of Labor, Bureau of Labor Statistics, Current Employment Statistics (CES) Survey, customized tables. Data released 2009. 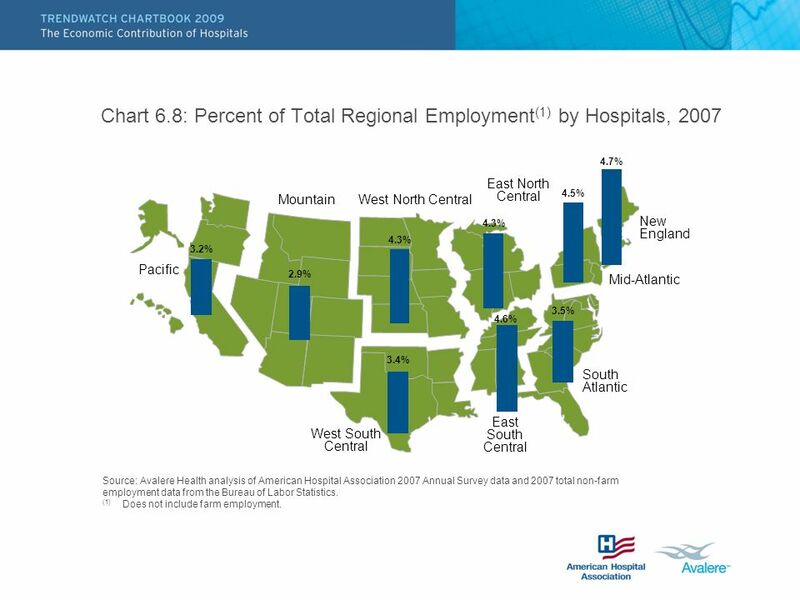 Link: http://www.bls.gov/ces. 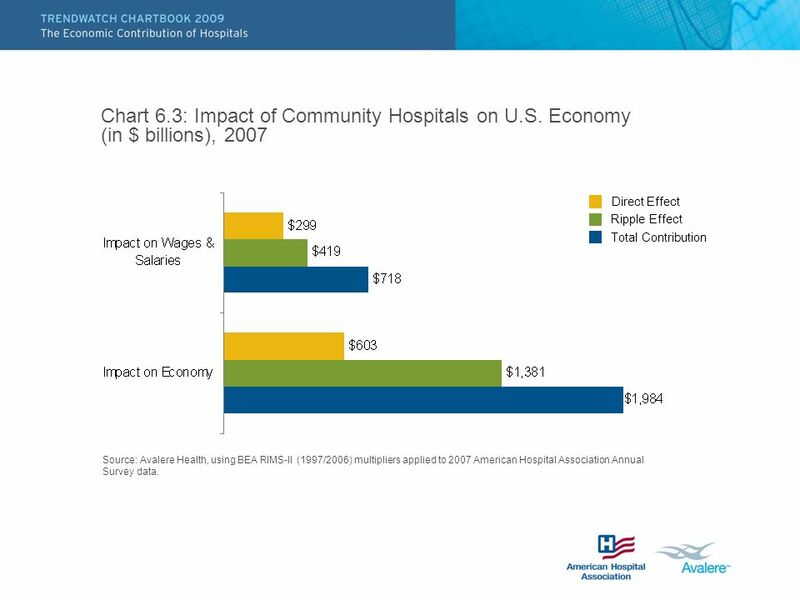 (1) 2008 figures reflect annual projections. 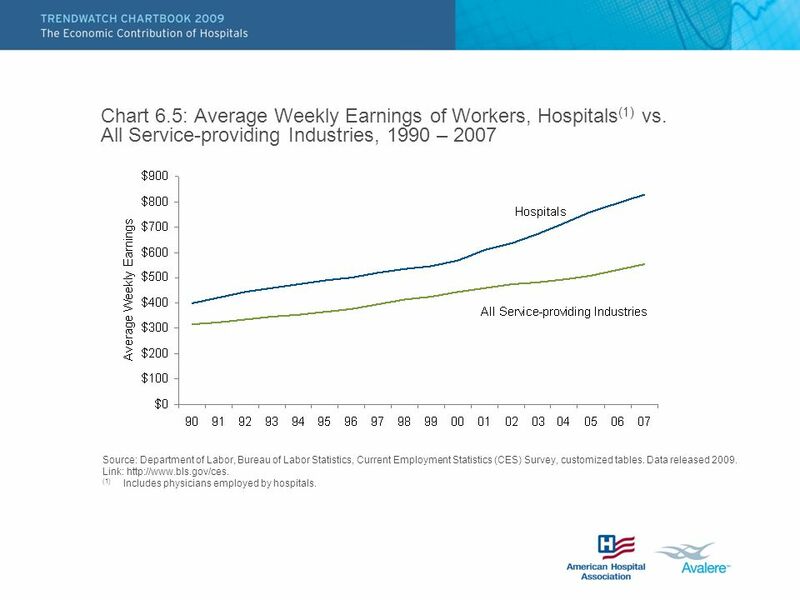 7 Chart 6.5: Average Weekly Earnings of Workers, Hospitals (1) vs. All Service-providing Industries, 1990 – 2007 Source: Department of Labor, Bureau of Labor Statistics, Current Employment Statistics (CES) Survey, customized tables. 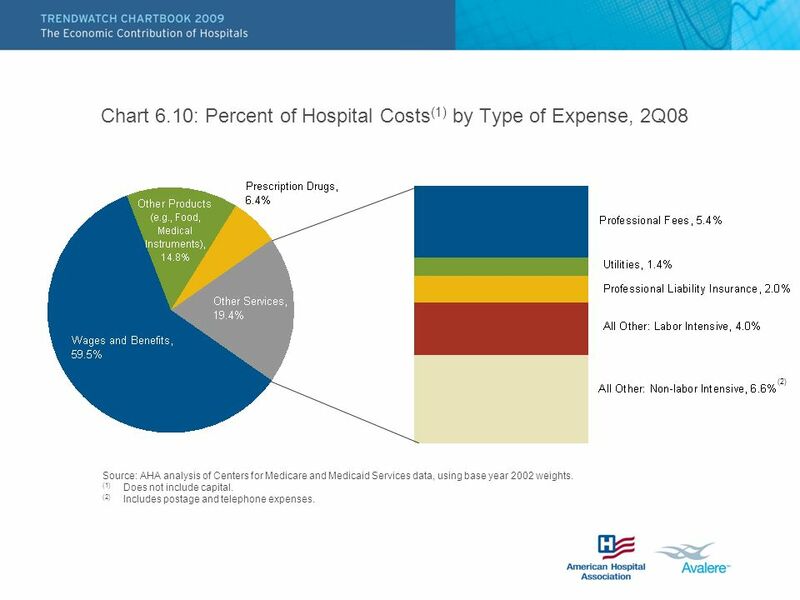 Data released 2009. 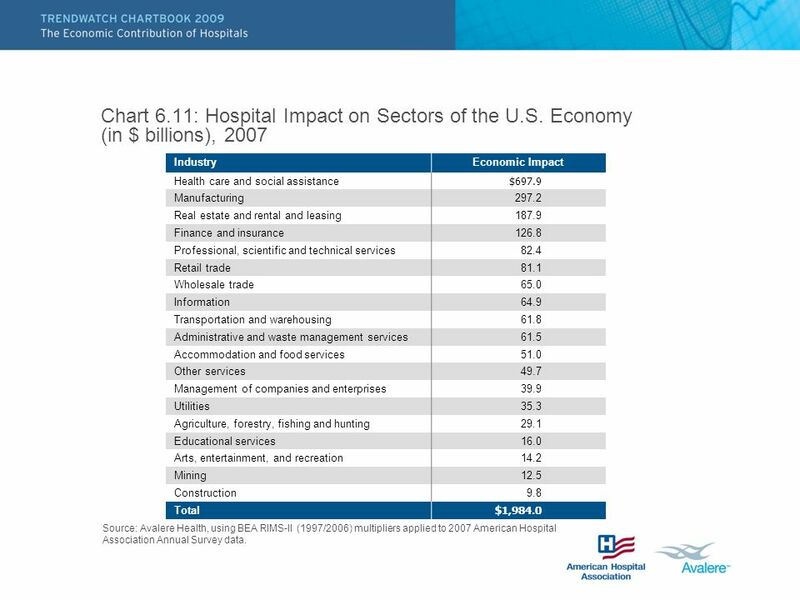 Link: http://www.bls.gov/ces. 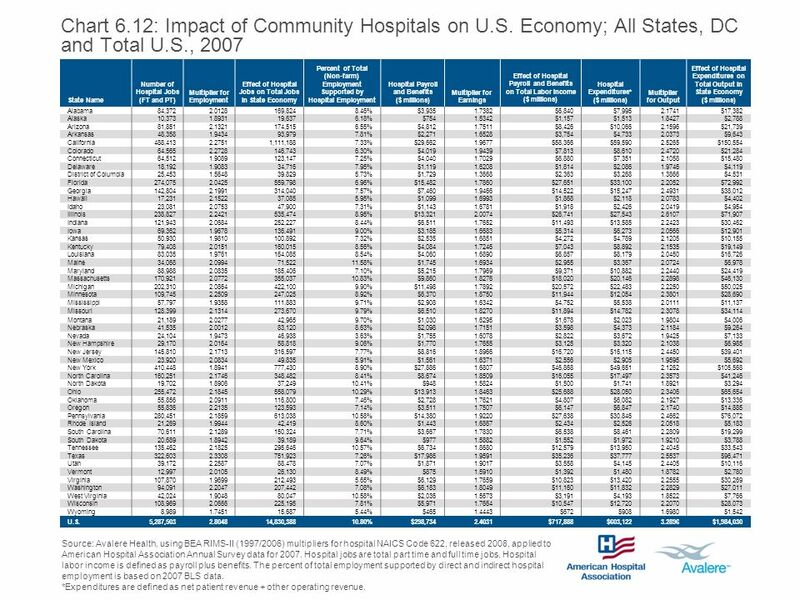 (1) Includes physicians employed by hospitals. 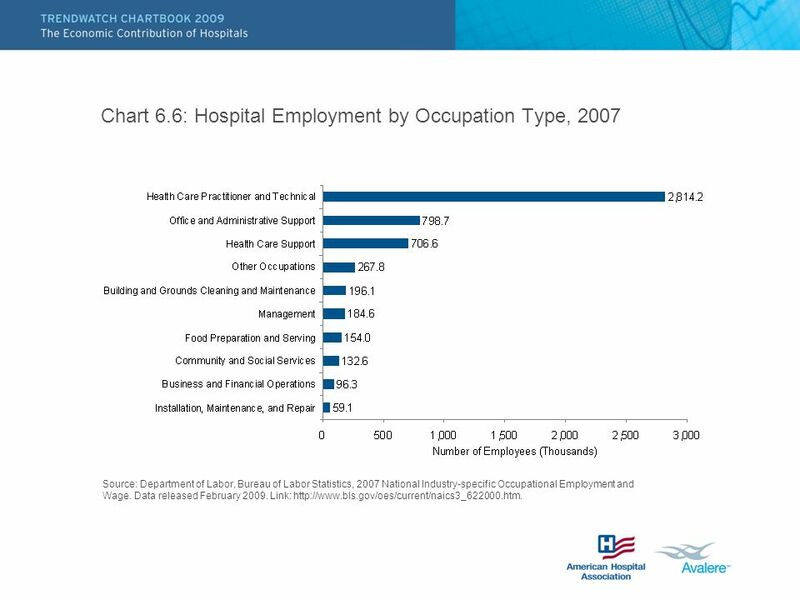 8 Chart 6.6: Hospital Employment by Occupation Type, 2007 Source: Department of Labor, Bureau of Labor Statistics, 2007 National Industry-specific Occupational Employment and Wage. 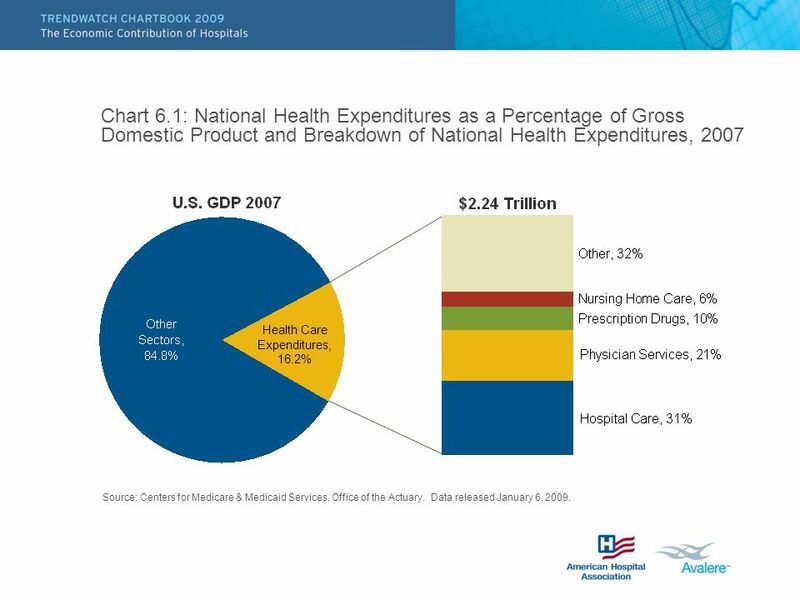 Data released February 2009. 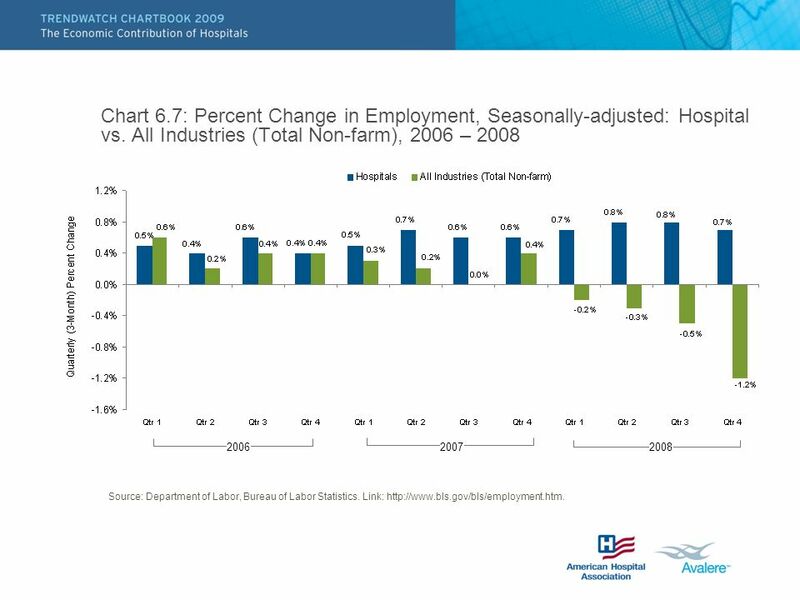 Link: http://www.bls.gov/oes/current/naics3_622000.htm. 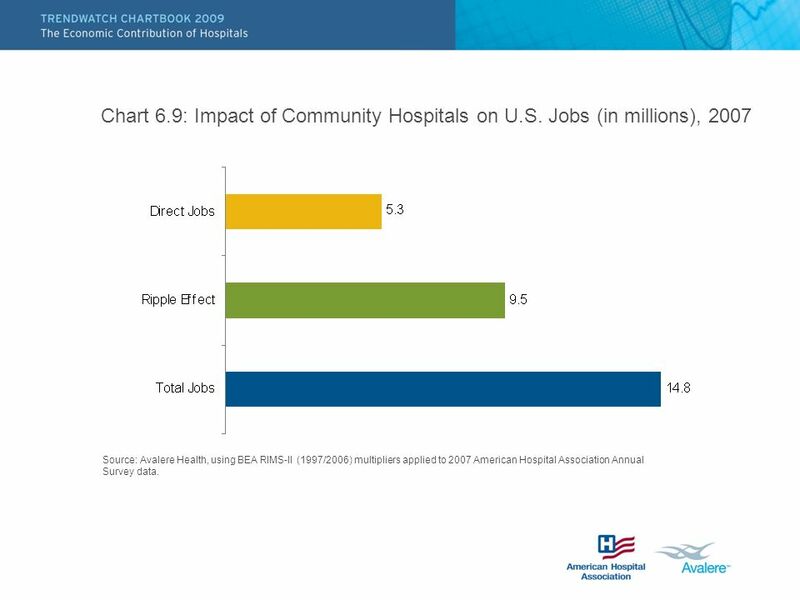 11 Chart 6.9: Impact of Community Hospitals on U.S. Jobs (in millions), 2007 Source: Avalere Health, using BEA RIMS-II (1997/2006) multipliers applied to 2007 American Hospital Association Annual Survey data. 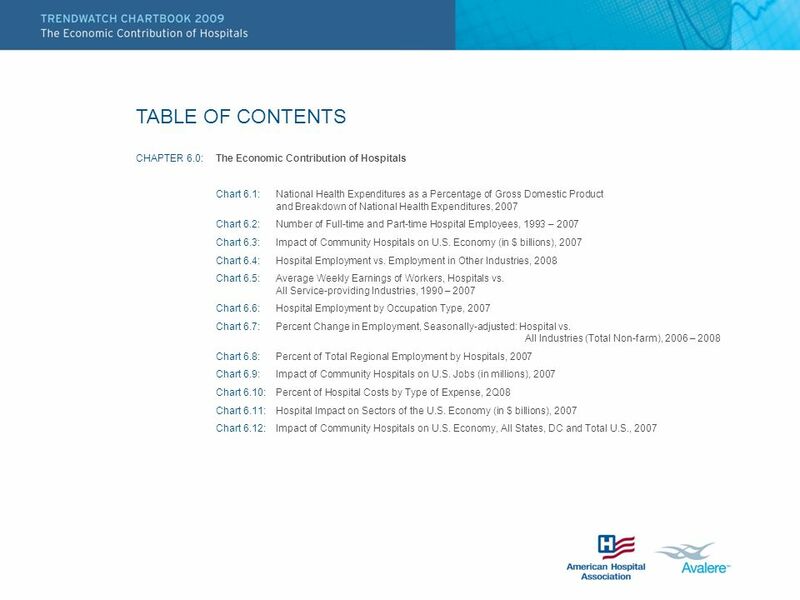 Download ppt "TABLE OF CONTENTS CHAPTER 6.0: The Economic Contribution of Hospitals Chart 6.1: National Health Expenditures as a Percentage of Gross Domestic Product."